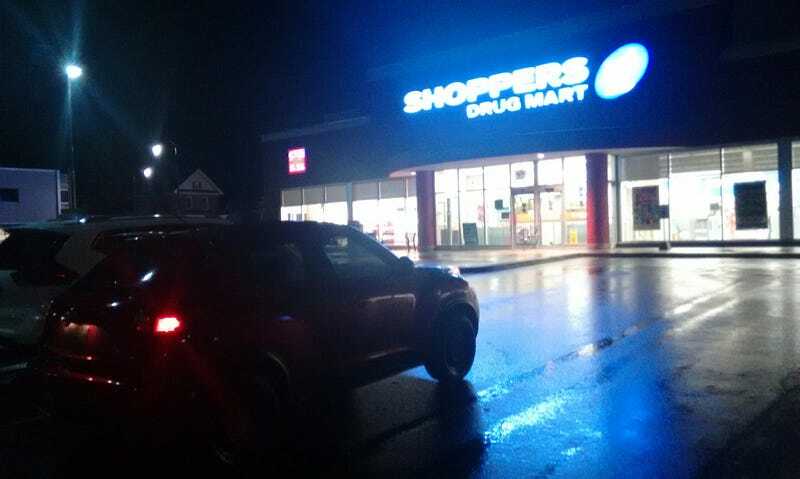 Under the soft glow of the lights of Shoppers Drug Mart I park thy Juke, good thing this location is open to 12:00am. I walk in, I walk around like half dead zombie. I buy what I need, then check out. The cashier is pretty cute, but a bit young for me. I'm pretty sure she is not sober, maybe a light buzz. The coffee she was drinking, was definitely not coffee. I walk out. Shampoo in left hand, keys in right hand. Gently out the shampoo in the passenger seat not too hurt it's feeling by dropping it. I check my leaking tire, 32.4 psi. It lost 2.5 psi in 5 hours, not as much as my lost soul tho. I get in. Right leg, then left leg. Left foot on the clutch, I gingerly press it it. Right food on the brake, I turn thy key. It starts, I pull it into nutrual while I do things on my phone. I finish in my phone. I put it in gear. Clutch out very gingerly, granny shift out of 1st. Ring out 2nd, the road is wet. My tires break loose. Poooowwweeeerrrrr. I proceed to granny shift to 5th. Is that a new smell, nope it's new character. Is that a new rattle, nope it's new character. I talk to my self. It was a good conversation. It was fun. Then comes a red light. It's has hues of warm coloues, neat. It turns green. I leave, traction is non existent. Thinking about my rear tire, those thoughts are deflating me. My shampoo is happy in thy passenger seat. It's snug, it's warm, it's glowing not knowing I going to tear it apart & rubbing its innards in my hair scarring it for life. My knees feel heavy, maybe it's blood pressure or my mother's spaghetti. Zac Brown Band comes on the radio, it's their new single "Roots". I like this song. Many songs, tires spinning, gears spinning, pistons stroking, I arrive home. I reverse in, then grab my shampoo & dirty work clothes. I open the garage door, go inside. The tractor is in front of me, not very intimidating. It smiles, I smile back. I walk into the entry way, the cat greets me. I walk down stairs, cat follows me. I make food, it was good. As I finish thy food I write the reducius title to waste your time.